The proper backpacking equipment is essential for an amazing road trip to the great outdoors. 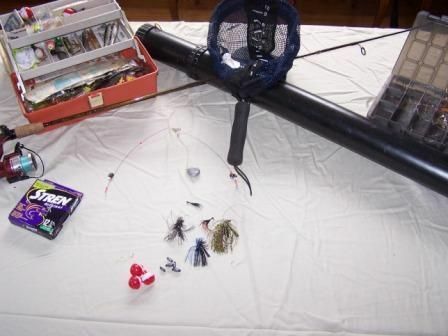 There are many great manufacturers of this type of gear and you can find it all online. You will want to invest money up front in equipment that will last a long time and is light weight. Remember, you'll be carrying all of your gear on your back-so plan accordingly. Before packing up the car for any backcountry road trip we always make sure that our gear is in good working order and packed up without exception. This is a list of our essential backpacking equipment and the food is discussed about separately at the bottom of the page. Your backpack must be able to hold all of your gear and fit comfortably on your back. It's a great idea to waterproof the seams on your pack to keep your stuff dry. 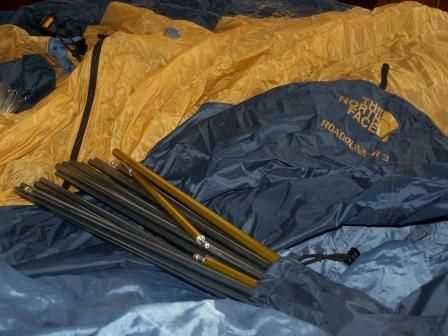 A low-temperature sleeping bag is critical for mountain weather. Avoid the heavy down bags and spend the money on lightweight bag with synthetic fibers. Your tent will be your home for the entire trip. Make sure it is waterproof, lightweight, and roomy. Bring lots of clothes and dress in layers. 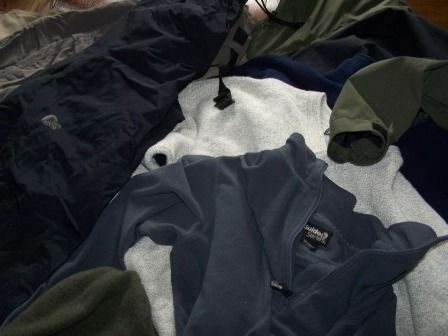 Avoid cotton and instead wear fleece and wool. Wear pants that can zip into shorts and don't forget your winter hat! 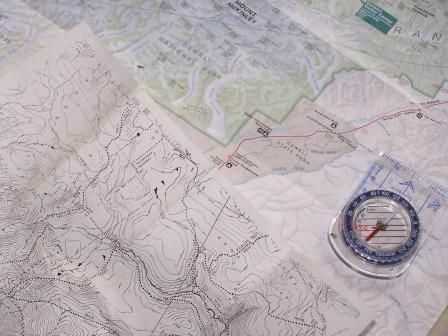 Try to get topographical maps of the area and know how to read a compass. Keep these handy for easy access. 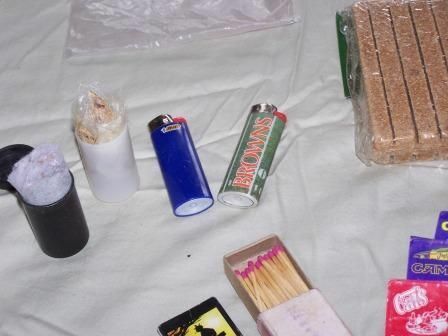 Have lots of fire-starting devices and keep them dry. Film canisters and zip-lock bags work great. Laundry lint holds a flame and the cattail ignites very quickly. 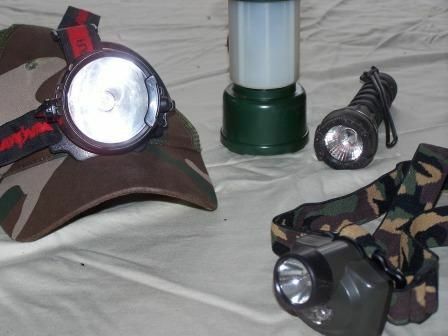 Headlamps work much better than flashlights because you can keep your hands free to cook or explore. Make sure to bring extra batteries. 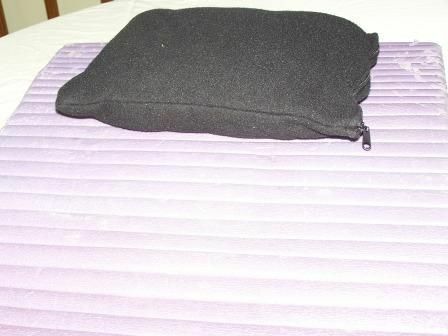 A good sleeping pad shields your body from the cold and damp ground and also keeps you comfortable. A pillow is lightweight and gives you a good nights rest. The ground cloth protects your tent from wear and tear and also keeps ground water and condensation out. To save weight, cut the material to fit your tent perfectly in advance. Drinking bad water and getting sick is no fun. 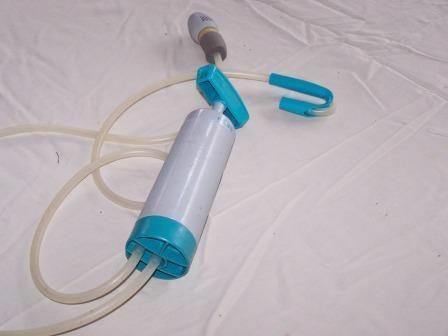 Make sure your water purifier is in good working order or at least bring water purification tablets. 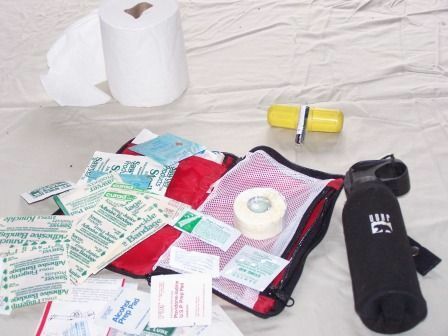 Your first aid kit is 100% essential and you hope you won't need it. 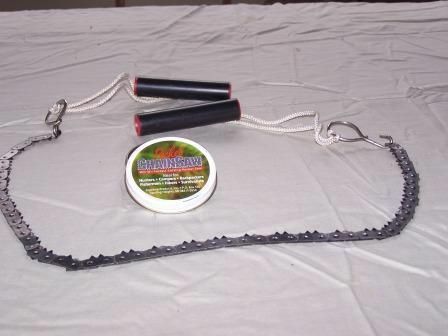 Include toilet paper, a snake bite kit, and bear spray if your in their territory. Check your kit regularly and update it. Sunglasses make you look cool. 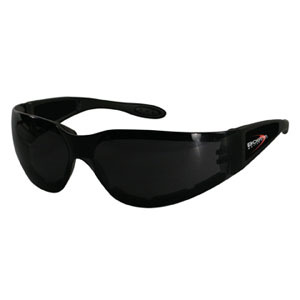 The other benefit is that they will shield your eyes from getting burned and temporarily blinded. My preference is the camp chainsaw because it makes short work of sawing through heavy lumber. You will need a method for safely gathering firewood for your fire. A good cooking kit is essential. 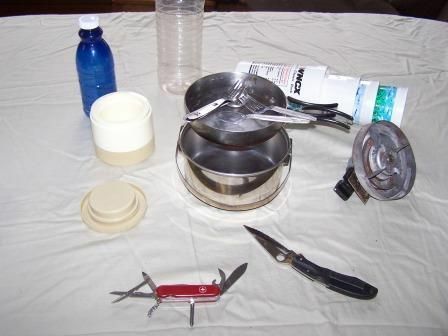 I bring a pot to boil water, camp stove, knives, plastic silverware, plastic cups, and water bottles. Paper plates and paper towels finish it off. 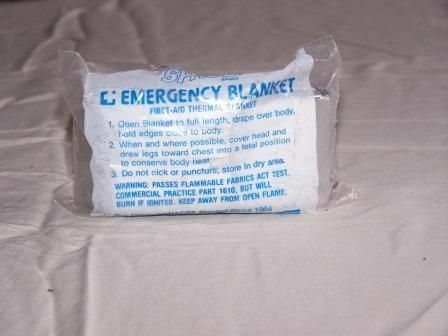 With any luck you will never need to open your emergency blanket. 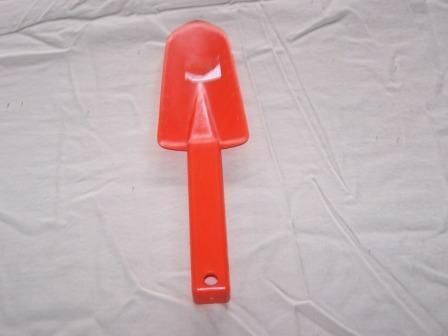 However this lightweight item can save your life if you find yourself in difficult circumstances. It's good practice to bury your unmentionables. Not only do they smell but nobody wants to be reminded of what you ate last night. 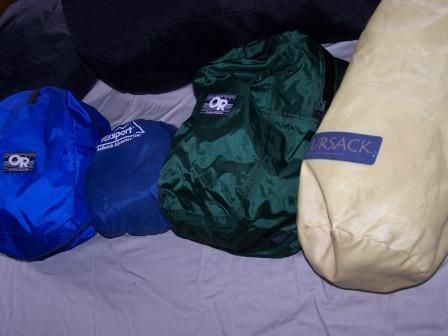 Put all of your items into waterproof stuff sacks before putting them in your bag or strapping them outside. 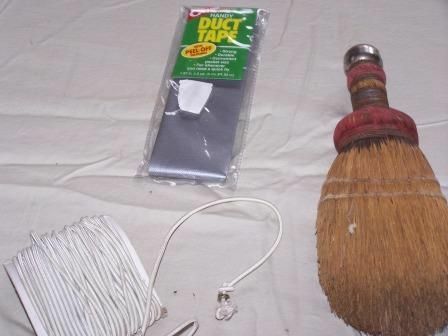 On long trips I like to bring nylon cord, duct tape, and a small broom to keep the tent clean and fix it (or the poles) if necessary. Mosquitoes are a pain in the neck. Candles, coils, bug spray, will work wonders. Playing cards and glow sticks enhance the camping experience as well and are lightweight. If you will be at a base camp for several days it's a great idea to bring in a fishing kit so you can catch dinner. If your trip is with a large group then you may be able to carry a camp chair instead of some of the other items which may be shared. 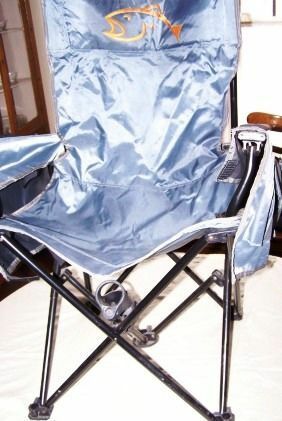 Your own chair will add lots of comfort to your backcountry adventure. 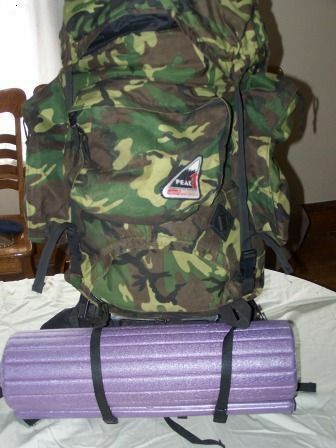 When packing your tent make sure you do not roll it up in the same manner it came from the store. You will be adding stress to the seams and fabric and allowing water to enter at these points. Try getting a larger stuff-sack and balling it up and cramming it into this sack-it will also save lots of time in the morning. 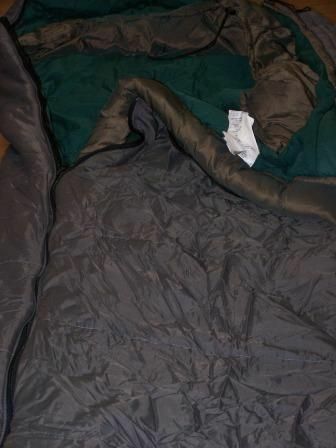 Do not roll your sleeping bag up tightly but instead use the same stuffing technique you will use for your tent. A tight roll will compress the fibers inside your bag and gradually make it less suited to keeping you warm in the cold weather conditions. Keep your pack weight as light as possible. Make sure you bring plenty of food and keep the weight to a minimum. Hang your food in a tree to put it in a bear canister to keep away unwanted guests. Make sure you clunk your boots together in the morning to get all the stones (and potential spiders & scorpions) out before putting your feet in them. Drink plenty of water on your trek-at least one liter of water per day and make sure it's clean! Paper plates, paper cups, and plastic silverware make cleaning up after meals a snap. For more backpacking tips and great advice check out the ultralite website-it is a complete resource. An amazing meal at the end of your journey is a great reward and extremely satisfying. 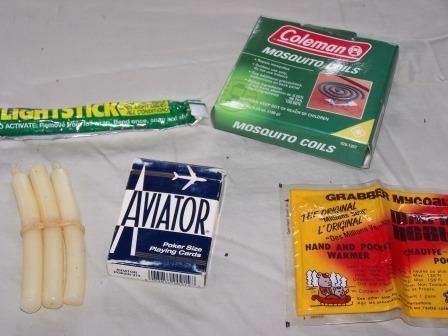 Some people love to pack light and therefore stick with the pre-packaged meals that are readily available at camping stores. Others like to keep costs to a bare minimum and go to the grocery store to buy freeze-dried boxed meals. Breakfast: We leave our house early on Saturday morning and grab a very hearty breakfast on the way. Lunch: This meal is best eaten on the trail while hiking to camp. I prefer a sub sandwich, bag of chips or pretzels, granola bar, and water to drink. Day Snacks: A few of my standard snacks include granola bars, rice-krispy treats, chocolate, hard candy, and cheese. Breakfast: After the previous night's feast the last thing I want to do early in the morning is dishes. There is a simple camp cooking method that I take advantage of in the morning and all you need to do is boil water. Once the water is boiled, pour it into disposable cups and bowls to make your coffee, instant oatmeal, and then toast up a couple bagels over the fire. After tearing down camp it's time for a piece of fresh fruit before heading out. Lunch: It's always an inconvenience to search through the pack while heading out of the woods. I generally have a very light lunch and will snack on some pre-made quesadilla sandwiches, beef jerky, and the left over snacks from the previous day. Dinner: I always make a point to stop at a local restaurant or diner before making the drive back home. Snacks: The remaining day snacks now are brought into the car to be munched on for the ride home!